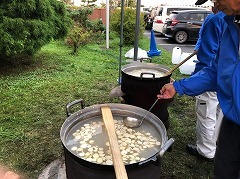 On 10th September, the team provided breakfast, lunch and dinner at the same evacuation site. 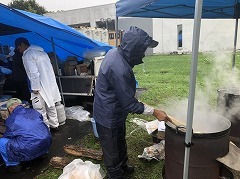 Not just the AMDA team, but some evacuees from the site also helped prepare the meals. Lunch was Pork Miso Soup with rice, and dinner was rice gruel with diced sweet potatoes. They provided roughly 180 portions of each. That evening, they cleaned up and the AMDA Support Farmers Group left to return to Okayama. The two coordinators, however, remained and conducted a field survey for the medical needs in the affected area on 11th September. 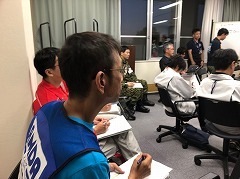 As of 5:00pm on 11th September, according to a report from the chief of the Crisis Management Section of the Hokkaido General Affairs Department, 41 people have died as a result of this earthquake. Additionally, 1,746 people are evacuating and running water is still widely unavailable.